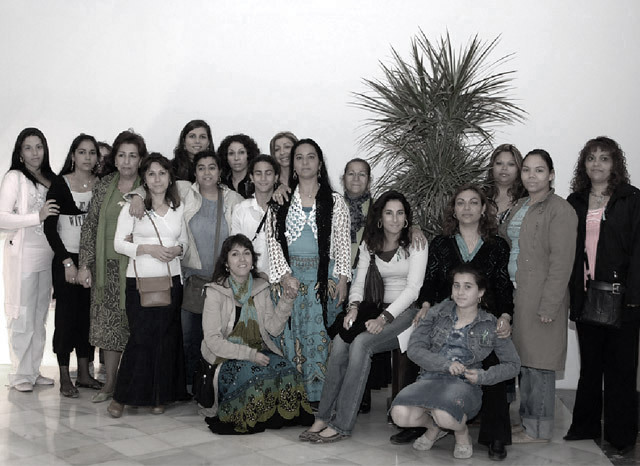 The Romani women’s association movement began in 1990 in Granada with the Asociación Romí. The movement arose out of the concerns of a group of Romani women who, aware of the situation of Roma women within their community, decided to raise awareness and help other women, given that such issues had rarely been addressed in the past. Romani women were in a period of tumultuous change, embroiled in a debate about their disadvantageous situation with respect to Roma men and non-Romani women, disconnected from knowledge sources and lacking representation from Romani associations and from other women’s movements. They had not been taken into consideration by the former groups and had been forgotten by the latter ones. However, and despite the aforementioned points, it would not suffice to discuss the situation of Roma women in a general sense. In such situations there tends to be a high degree of variability depending on one’s status, the family to which one belongs, one’s education, age, religious affiliation, etc. The first Romani women’s associations were an attempt to consolidate a feminist movement by promoting Romani women through participation, a determined attempt at transformation. These associations were also standard-bearers for many others that came after them. The Drom Kotar Mestipen (1999) association in Barcelona is an example. Many ground-breaking organisations point out the difficulties they faced and their initial sense of caution. However, they also stress that their aim was to defend the interests of Romani women within the interests of their communities. In recent years there have been important advances, mainly in the creation of standard-bearers: educated women who serve as role models for other up-and-coming women. Many Romani women who are university students already have a prepared speech. However, many other women who have not gone through the educational system are placing high stakes on role changes that will entail different ways of negotiating with men, the defence of their group-orientated way of life, dialogue with both Romani and non-Romani women, their participation in shared fora for the exchange of experiences and the resolution of some problem areas. Where there has been little change is in the area of the men’s association movement. Venues for both ethnic expression and intercultural exchange are needed. It is a question of what we want our society to be like. Young women, mature adults, elderly women, out of respect for Romani men; single, married or widowed women; women with or without university education; women from precarious or well-off economic circumstances; street vendors, lawyers, teachers or women from other professions. Most emphasise the importance of education in today’s society, how important family is to them and how it provides needed support for their personal development. They also speak of feeling Roma even though it is an abstract and difficult concept to define, their role as standard-bearers, generational changes, the need to live in the present, and the need to develop a Romani feminism based on negotiation and that constitutes a quiet revolution.